Last week’s other top-gaining mining stocks on the TSX were First Quantum Minerals, Husky Energy, Gran Colombia Gold and Northern Dynasty. The S&P/TSX Composite Index (INDEXTSI:OSPTX) opened 87.97 points higher on Friday (January 18) at 15,299.19, driven by consistent gains in the energy sector, keeping the TSX on track for its fourth consecutive week of gains. Oil prices were up 1.1 percent following an OPEC report indicating a significant drop in production last month, quelling worries of an ongoing global glut. The positive gains in the energy sector were bolstered by steady momentum in the healthcare and financial sectors. Canada’s largest index sat at 15,296.94 at midday. 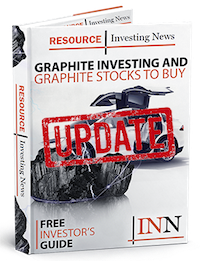 Mine development company NextSource Materials is currently developing its wholly owned Molo graphite project in Madagascar. The Canadian company is also looking to advance the Green Giant vanadium project, located within the same property claim. Early last week, NextSource received conditional approval for the global environmental permit for Molo, with President and CEO Craig Scherba calling the move “a significant achievement.” According to the company, it will receive the global environmental permit once its receives its mining permit. Company shares were up 16.67 percent to C$0.105 by the end of the week. First Quantum Minerals is a diversified miner primarily focused on copper production. The company which began exploring in 1996, operates seven mines around the world. In addition to copper, First Quantum also produces gold and nickel. On Tuesday (January 15), First Quantum released its Q4 2018 and full-year results. Copper production was up 6 percent for the year, and sales increased 3 percent as well. Company shares grew 15.82 percent last week, to C$12.96. Alberta-based Husky Energy is one of the province’s largest energy producers. The company has a number of onshore projects and resources in Western Canada and the US, as well as a variety of offshore projects in the Asia Pacific and Atlantic regions. Husky said Thursday (January 17) that its offer to acquire MEG Energy (TSX:MEG) has officially expired without an extension being granted. Shares of Husky climbed 12.38 percent, trading at C$16.79. Mid-tier gold miner Gran Colombia is currently focused on developing its Segovia and Marmato operations located in Colombia. According to the company it is the largest underground gold and silver producer in the country. Gran Colombia also released its Q4 2018 results mid-week, highlighting a 25 percent year-over-year production increase. Gran Colombia stock was up 11.08 percent last week, to C$3.51. Northern Dynasty Minerals is a diversified developer currently advancing the Alaska-based Pebble copper, gold, molybdenum and silver resource through its solely owned Pebble Limited Partnership. On Tuesday, Northern Dynasty reported the filing of a preliminary short form base shelf prospectus with the securities commissions in each of the provinces of Canada, excluding Quebec. Shares of Northern Dynasty were up 10.47 percent, to C$0.95. Data for 5 Top TSX Stocks articles is retrieved each Friday at 10:30 a.m. PST using Trading View using Stock Screener. Only companies with a market capitalization greater than $50 million prior to the week’s gains are included. Companies within basic materials and energy sectors are considered. Editorial Disclosure: NextSource Materials is a client of the Investing News Network. This article is not paid-for content.